The editors just received word from the author that his paper had to be taken down until further notice, pending approval of posting of some of the photographs in his provocative paper. We did so at the request of the author, who is awaiting approval from CNN to display the photographs of the military plane in question. The editors will restore this paper as soon as approval is received. Also, please note the letter by Steven W. S., "A Response to the Bennett/Manwell Exchange." Angus-Reid poll is unwarranted nit-picking. More importantly I feel that it is also an invalid criticism." "Retired general censured in Tillman case"
AP Article: "It's a perfect storm of mistakes, misjudgments and a failure of leadership," said Geren in announcing his decision after an investigation into the death of the former pro football player. Aha - mistakes. Sort of like the "mistakes" of NORAD on 9/11? Maybe like the Secret Service breaking protocol in a Florida classroom? Let us not forget that Pat Tillman recieved 3 shots to the head in "close proximity." From an "M16... 10 yards away"
10 Yards. That's one first down marker on a football field. A short pass. Keep that in mind. Incompetence is always the first scapegoat they bring out to cover intent. "No evidence at all of enemy fire was found at the scene _ no one was hit by enemy fire, nor was any government equipment struck." Nick and Kyle from urnotfree were the guests on Monday night's edition of TTR. 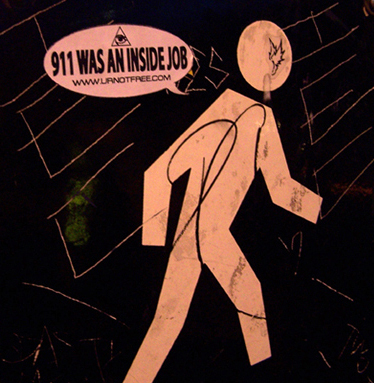 Topics include guerrilla street art for 9/11 truth, doing street actions on the Strip in Vegas and the upcoming General Strike on September 11. We talk to Chris (CV) from truthaction.org and Luke Rudkowski calls in with breaking news of a confrontation with Nancy Pelosi. This may well have been already reported here, but in case it got missed, I noticed it just now. Here is the link. Noting that she tends to be about six months ahead of mainstream thinking when she speaks up about things, Cindy Sheehan speaks of her doubts about 9/11 in the context of those in power using another false flag attack to implement martial law. Lukery posted this over at Daily Kos. In a recent speech, Sibel again emphasized that the reason that she has been gagged is not for reasons of national security, but rather to cover-up criminality, treason, by high level US officials. As evidence for this claim, Sibel explained that for the three months prior to Ashcroft blanket-gagging her case, the FBI was conducting unclassified briefings for Congress on the case. In other words, from the beginning, neither Congress, nor the FBI, even considered that this information might be classified, let alone a 'national security' issue. As Michael Ostrolenk, National Director of the Liberty Coalition, said: "The excuse of protecting national security is fallacious." NYC and the First Responder Fund Raiser out of reach? If you live near the nation's capitol, there is a good alternative, four full days of action in DC. A benefit to activism at the capitol is that Congress will be in session, so the Representatives will really have to work to avoid seeing you. Especially if you spend some time being seen around the House. Come to Washington this September for the historic union of the 9/11Truth, Peace and Impeachment movements.March with us as we honor the victims of 9/11 and the thousands of casualties of the illegal wars in Afghanistan and Iraq. Call for the end of the bogus war on terror, impeachment of the criminals in the White House and restoration of our civil liberties. Pennsylvania Ave., in front of the White House. Cross country walkers arrive. Senator Gravel has been very supportive of the idea of a new 9/11 investigation. He has a staff that is very friendly to 9/11 skeptics, and if we can show the campaign that we want a candidate that will stand with us, Gravel could be that man. All 9/11 skeptics are hereby called upon to write an email to the Gravel campaign to invite Mike to attend the WeAreChange/Alex Jones fundraiser in NYC, or to come and join the festivities in Washington on 9/11/07. No form-letter-template here, use your own words, and let Gravel know that you want a candidate who isn't scared to look 9/11 in the eye.